Bronte has a very bad attitude about either lunch or her father’s leg hair. I’ve been making one-eyed Jacks for Brontë lately because she loves them, though after breakfast they don’t look so much eaten as scattered by a Special Forces team of Barbies armed with miniature weed whackers. After mentioning this to a few friends, I was surprised to hear “What are one-eyed Jacks?” I explain that it’s the dish where you cut a hole in a piece of bread, fry it in a little butter, break an egg in the hole, and flip it over–so you have a piece of toast with a fried egg. I’m still trying to find something to make the perfect size circle in the bread. A normal glass is too big–it leaves the bread vulnerable to breaking at the weak points–but the hole needs to be big enough to contain the yolk. I’m making do with a juice glass for now, but have a nagging feeling there is something better out there. 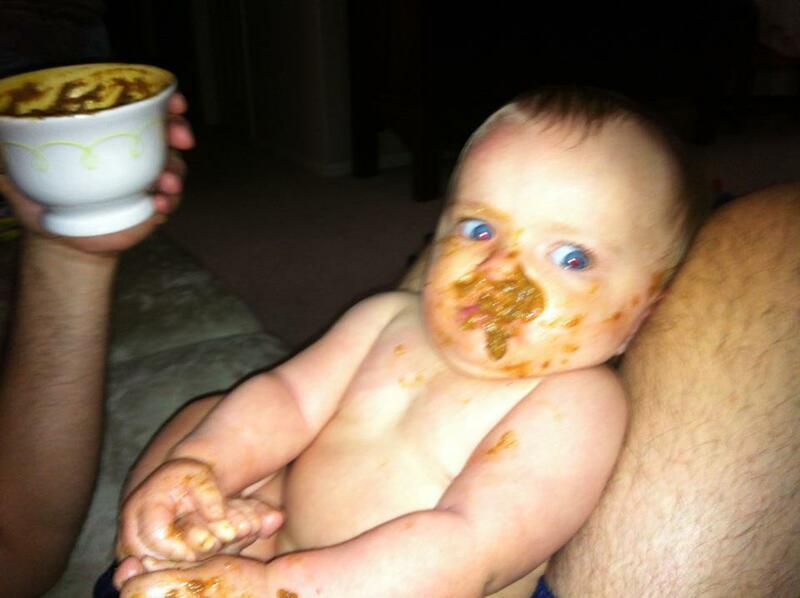 But I digress… Feeding my baby is something I’ve taken quite seriously. I’m convinced that if I introduce foods properly, I can shape her palate in a way that will be better for her health later, and my unusual approach has been somewhat controversial among my friends. First off, I haven’t used any rice cereal whatsoever. I know it’s considered an absolutely integral part of baby-feeding by many, but I have a bizarre theory that the reason we think of bland, creamy foods as “kid foods” is because that’s all we feed them for years. They get used to it, then suddenly we spring “adult” food on them, and they revolt. It just doesn’t make sense to me that all kids have to eat Lunchables and chicken nuggets, because kids in Japan eat sushi, and kids in Scandinavia eat herring, and what did medieval kids do when there were no Spaghetti-O’s available? I decided to back away from any preconceived notions about what kids would eat, and let her try everything we were eating. So, in the spirit of my great grandmother (who was a farmer and also right about the merits of breastfeeding) I never bothered buying any baby food or rice cereal. Not that there’s anything harmful about rice cereal, I just don’t believe it’s essential for baby health (or countries that didn’t grow rice would’ve been in deep trouble for centuries). I did a little research on rice cereal, just to make sure I wasn’t doing anything dangerous, and it turns out that there is a good reason people think we need to feed it to babies, but one that no longer applies. Back when formula feeding first swept the nation, formulas were apparently short on iron. Rice cereal is supplemented with iron, so babies that were fed rice cereal thrived better than those who were not. Formulas now contain enough iron, but the belief that rice cereal is critical persisted. At any rate, I never used baby food or rice cereal. My husband and I blended up stuff like applesauce, almond butter, spinach, bananas, berries, and cinnamon, and Brontë was perfectly happy with it. I realize the almond butter is controversial, considering I was advised not to even eat nuts during pregnancy for fear of allergies, and admit that the first time I gave it to her, I was nervous and watched her closely for any sign of a bad reaction. We have no history of nut allergies in my family, though, and nut oils are a wonderful type of fat. I expected the almond butter to be met with raised eyebrows, but was surprised how alarmed people were by the addition of cinnamon. “Is that okay for her?” people would gasp, “Is that dangerous?” No, it isn’t. My thoughts were that if children are only fed bland, mildly sweet foods for years, they would grow to only like bland, sweet foods as adults–so why not throw in a little spice to get her used to more flavor? At any rate, it never caused any problems. Now that she is getting some teeth, we have moved onto mashing up our dinner and offering it to her, with mixed results. Sometimes she loves an unexpected food, like edamame and lobster bisque. Sometimes, as you can see in the photo above (our failed chili experiment), she spits it everywhere and flies into a violated rage. I have discovered, though, that sometimes she rejects a food a couple times before liking it. The first time we gave her avocado, she spit it everywhere and screamed at the top of her lungs. We persisted, and I think the third time we offer it, she decided she was cool with avocado. Now she’s a huge fan of guacamole and I’m glad I didn’t give up on avocados after the first bad incident. Time will tell whether any of these experiments bear fruit, and I’m sure every child is different. They are probably all extremely messy, however. Feeding kids solids makes you long for the days of bottles. They will yank food out of their mouths to stare at it, drool it out between bites, and occasionally throw it. Don’t even get me started on food made up of tiny particles… it gets into every crevice from your child to a one foot radius around the highchair. You try to pick them up into a little ball to shake them directly over the trashcan or sink, unless you need the sink for an immediate post-dinner bath. You’re better off keeping the bowl out of reach and spoon-feeding them stuff like rice or grains, or it’s going to look like someone set off a food bomb in your house.